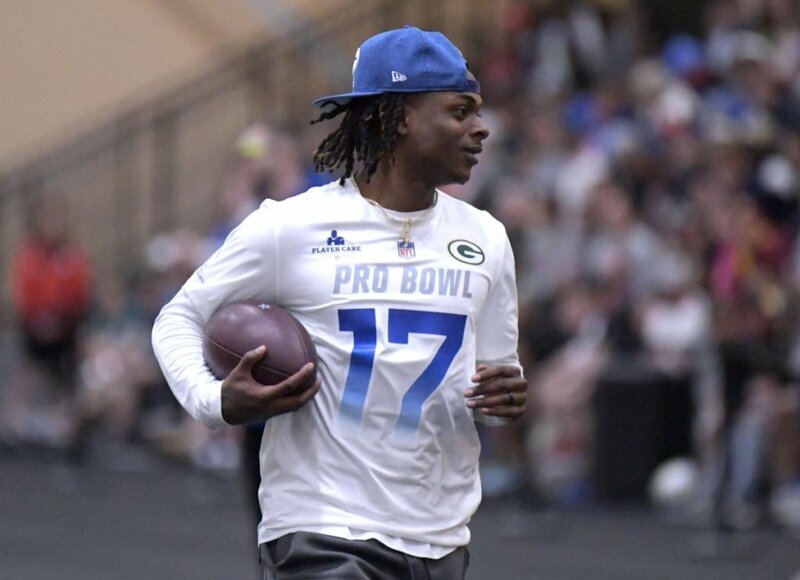 While many scoff at the idea of even watching the Pro Bowl, it was nice to see Davante Adams get some more play time before next season. Adams was the only player from the Green Bay Packers to decide to play this year. As expected, he got off to a great start and then led the NFC in passing yards for the game. Aaron Rodgers was also invited to play but he opted to spend time with Danica Patrick in New Zealand so it’s hard to blame the guy. The pass was thrown by Seattle Seahawks QB Russell Wilson. Adams is coming off a very strong year with the Packers – he set three career highs with 1,386 yards, 13 TDs, and 111 receptions. He was set to top Sterling Sharpe’s record for receptions but missed the final game of the season against the Detroit Lions due to an injury. This absolved him of any blame from the embarrassing final score of 31 – 0. Final score was AFC 26 NFC 7. Just in case you’re wondering, there are no injuries to report for Adams after participating in the game. Not that it really matters, but he was too injured to play in the final game, but yet played in the stupid pro bowl? If my memory hasn’t failed me Kato, it seems the last 2 seasons we didn’t make the playoffs. I recall a influx of placing players on injured reserve the last 2 or 3 weeks of the season. I don’t know the reason but if they wanted to get a look at other players, they clear roster spots and provide some other guys opportunity’s. I think that is the right move. I don’t go for this Rodgers and Bahk stuff of were leaders, we play, blah blah blah. I say get a look at other guys if your fate has already been determined. You made a mistake above. Rodgers is off with Danica Patrick, not Olivia Munn. That succubus was cast back to the fires of hell a while ago. You expected him to get off to a great start and lead the NFC in passing yards? Gee, keep in mind a TE on the NFC team had 3 more catches than him. Another TE had a TD and Adams did not. Adams’ total for the game was 2 catches for 41 yards. If you only read this article and did not look at game stats you would think Adams dominated or something. Deceptive! Is this what it takes now? Deception? Fool the fans into staying fans? By the way, Adams was targeted 4 times and caught 2 of them. One was the highlight shown the other was a 5 yarder in the 3rd qtr. So basically Adams had one catch on the first play of NFC offense and was a total non-factor or detriment after that. Go ahead and brag though….